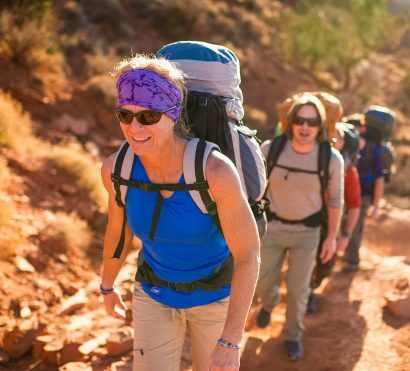 Experience two of the most famed trails in the world and stay at the most coveted campgrounds in Grand Canyon National Park on our Classic Colorado River Grand Canyon backpacking trip. 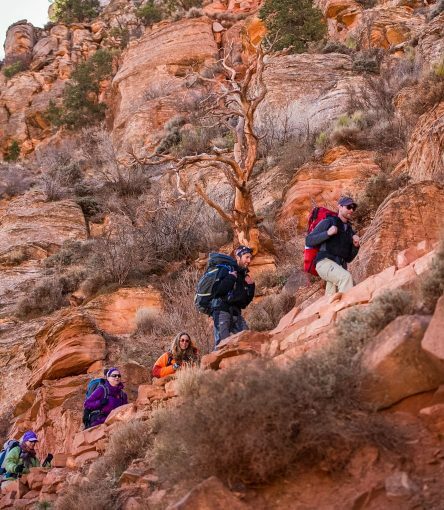 Descend into the Grand Canyon along the South Kaibab Trail. As you hike along, enjoy the spectacular vistas that this route is known for. Just when you begin to think your Grand Canyon vacation feels like a lot of work, we’ll cross the Colorado River and settle into the of the most spectacular Grand Canyon camping locations – Bright Angel campground. Day two of your Grand Canyon backpacking trip is full of endless opportunities for exploration as you make your way along Garden Creek to the campground at Indian Gardens. By the time you reach camp for the second night, you will feel you’ve become attuned to the canyon’s rhythms, curiosities, and intricacies. The hike out to the Rim along Bright Angel Trail follows in the historical footsteps of those who have made the trek along this route. Before white settlers came west and ventured into the canyon, Bright Angel Trail was used for centuries by native tribes. As you hike along, soak in the sun as it dances across the multi-hued rock layers and wisps of cloud play tag with the towering temples and buttes. “Request Now” dates are dates that are not yet permitted. Let us know if you’d like to request alternatives not listed here. 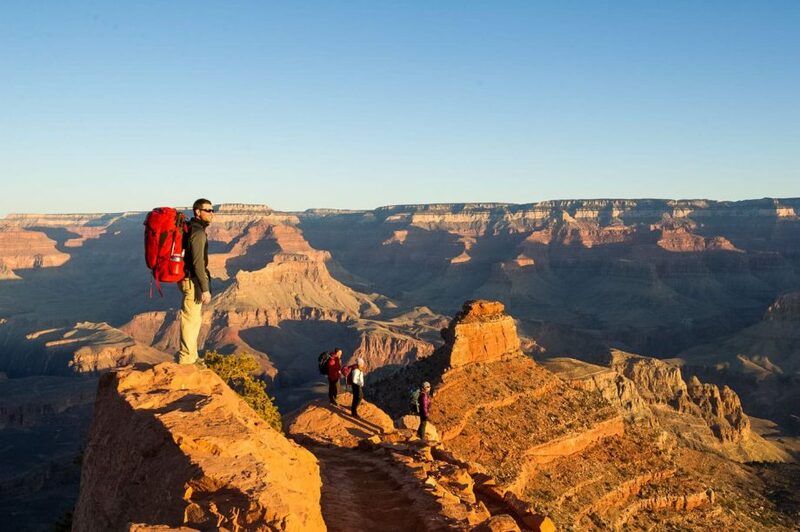 On this guided Grand Canyon backpacking trip, you'll descend the South Kaibab Trail, camp at Bright Angel and Indian Gardens campgrounds, and hike up the Bright Angel Trail. 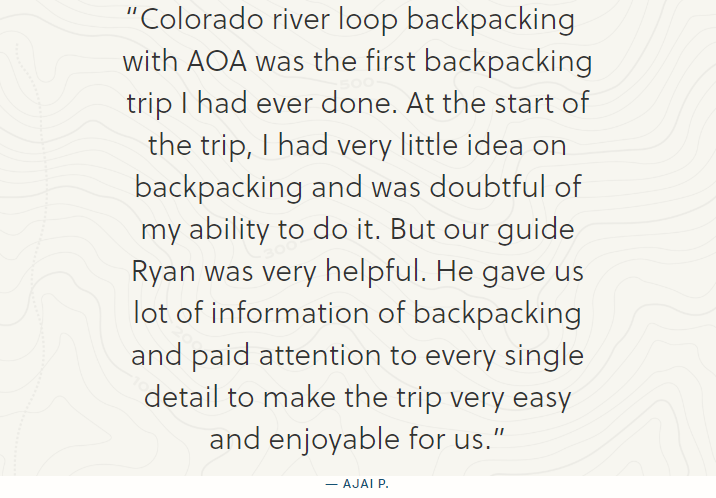 On our Classic Colorado River Grand Canyon backpacking trip, you’ll descend into the Grand Canyon along the South Kaibab Trail on Day 1. Camping in the Grand Canyon at Bright Angel campground is without a doubt a bucket-list item for any adventurer. On Day 2 you’ll have endless opportunities for exploration as you make your way along Garden Creek to the campground for the second night at Indian Gardens. 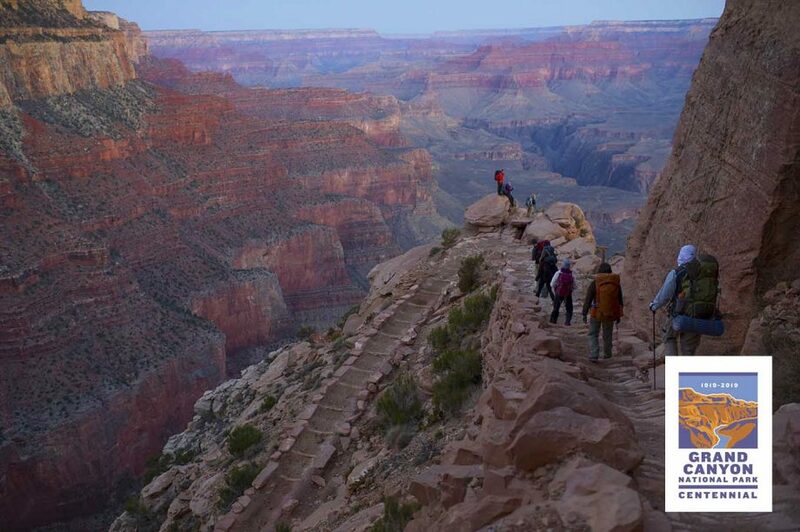 Day 3 is your hike out day, and you’ll ascend to the Grand Canyon South Rim along the Bright Angel Trail. Trip End: Drops off in Scottsdale, AZ between 4 – 6pm on day 3. Your guides will pick you up from the host hotel in Old Town Scottsdale at 6am for the drive to the Grand Canyon. The South Kaibab Trail is the shortest trail to the Colorado River and is famous for its spectacular vistas. Your hike to the bottom of the Grand Canyon today snakes down the spine of a ridgeline and affords unobstructed views that simply can’t be found in other parts of the canyon. Enjoy spectacular photo opportunities at Ooh Aah Point, Cedar Ridge, and The Tip-Off. 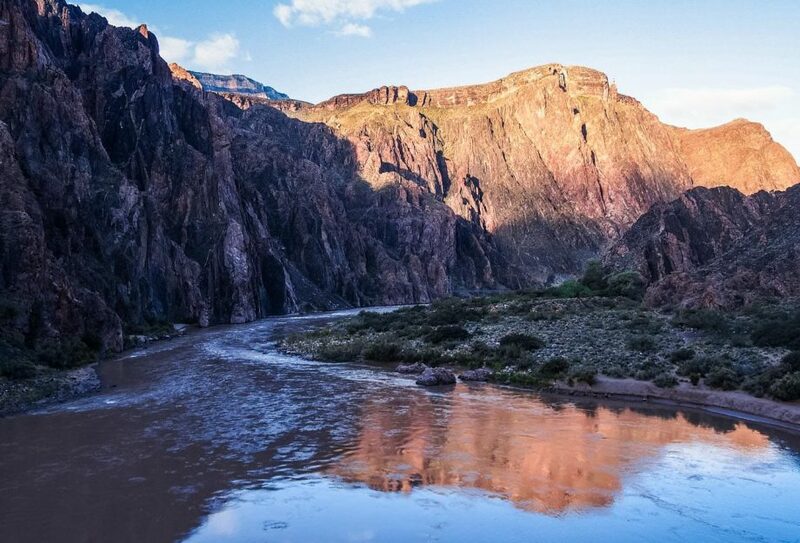 Once we reach the canyon floor, we will cross the Colorado River via ‘The Black Bridge’ and get a close up look at the ruins of an ancient pueblo. 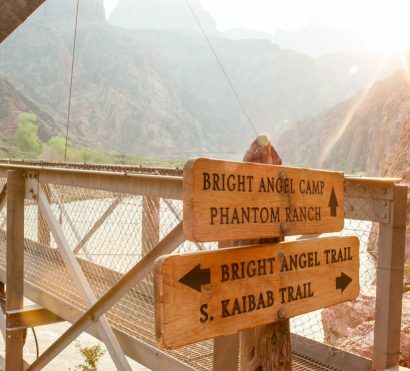 Just past ‘Boat Beach,’ where river runners on Grand Canyon rafting trips stop to exchange passengers and visit nearby Phantom Ranch, we will reach our camp among the shady cottonwoods next to Bright Angel Creek. After you get settled in, choose to visit historic Phantom Ranch (they have ice cold beer! ), explore ‘The Box’ and Phantom Canyon, or just lounge by Bright Angel creek. There are even trout in the creek; fashion yourself a pole and have a go! Enjoy a leisurely morning and a great breakfast before breaking camp. Today we cross ‘The Silver Bridge’ and traverse along the Colorado until reaching the mouth of Garden Creek. The hike this morning ascends the Bright Angel Trail to Indian Gardens. As you hike along, imagine the amazing forces that have carved this intricate landscape over the millennia. Let the canyon awaken your inner curiosity and keep your eyes peeled for the incredible wildlife that call the canyon home, including whiptail lizards, impressive desert bighorn sheep, and even rare California Condors. Your professional guide can provide more Grand Canyon facts about flora, fauna, culture, and geology than you could ever imagine. Tonight’s camp is situated in the cool shade of giant Fremont Cottonwoods, near the perennial springs that for centuries watered the gardens of the Havasupai Indians who once called this part of the canyon home. Soak your feet in the cool waters of Garden Creek or take an optional side hike (without the packs!) to Plateau Point, one of the most famous views in the canyon. Today will be an early start to make the most of the cool morning air. 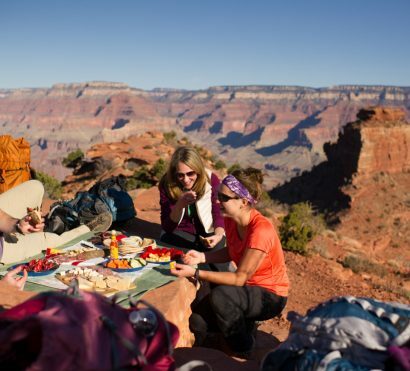 Break camp over breakfast and bid the relaxing haven of Indian Gardens a fond farewell before heading for the Grand Canyon South Rim along Bright Angel Trail. This route has been used by humans for at least 10,000 years and is still one of the most popular trails in the canyon. The first mile of the trail slopes gently upwards, creating a nice warm-up for the push to the rim. Soon you will come to Jacob’s Ladder, a series of tight switchbacks twisting up until the trail surmounts the Redwall Limestone. Take a well-earned break at 3 mile Rest House, a site used for agave roasting by the Ancestral Puebloans a thousand years ago. Don’t forget to soak in the magnificence of the canyon around before continuing your ascent through the changing rock layers to the rim. Your guide will help you along the way, answering questions, sharing stories about the geology of the surrounding monoliths, and pointing out hawks, eagles, and the ancient red ocher pictographs that were painted onto the rock centuries ago. 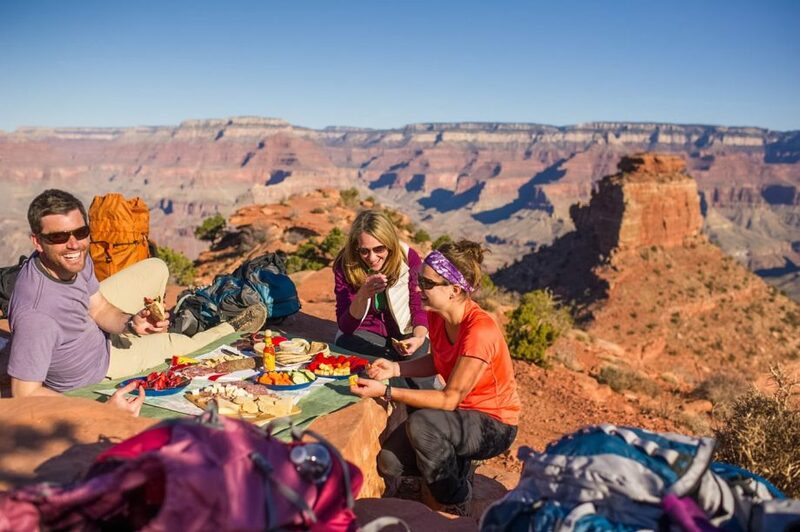 Back on the rim, enjoy a delicious and well-deserved lunch and reflect on your accomplishments and Grand Canyon vacation before beginning the scenic ride back to Phoenix.